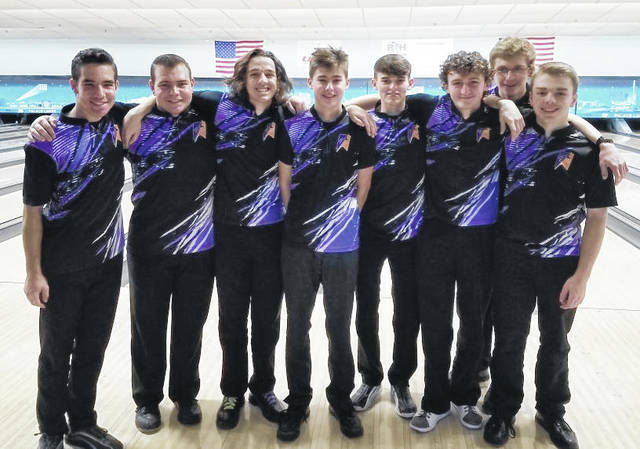 The Butler boys bowling team competed at the 15th annual Ohio High School State Invitational Kick-Off Tournament in Columbus last week. Pictured left to right are Kyle Seelbaugh, Aaron Seelbaugh, Drew Sacks, Ian Jacobs, Will Yeary, Zach Luttrell, Jake Smith, and Ben French. The Butler girls bowling team competed at the 15th annual Ohio High School State Invitational Kick-Off Tournament in Columbus last week. Pictured left to right are Katrina Hetzog, Alyssa Perkins, Breanne Kroeker, Emily Gabert, Alissa Spieles, and Emma Sutter. 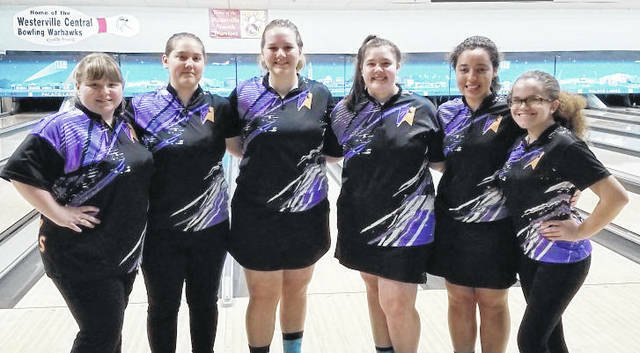 COLUMBUS — The Butler boys and girls bowling teams traveled to Columbus last week to participate in the 15th annual Ohio High School State Invitational Kick-Off Tournament. The Aviator boys, seeded 12th after qualifying rounds, placed eighth overall while the Lady Aviators missed qualifying and placed 22nd overall. Alissa Spieles was third overall with a 584 that qualified her for the All-Tournament team. In individual matches, the Butler boys swept two while the Lady Aviator split a pair of matches. Butler improved to 3-0 overall and 2-0 in Greater Western Ohio Conference play with a 2,542 – 1,967 win over Stebbins. Drew Sacks bowled a 444 (216-228), Aaron Seelbaugh 442 (195-247), Will Yeary 425 (201-224), Ben French 421 (205-216) and Ian Jacobs a 211. The girls defeated the Indians 1,688 – 1.419 to improve to 1-1. High for Butler was Katrina Herzog with her personal best high game (201) and high two-game set (355). Alissa Spieles added a 190 game and Emily Gabert a 189 game. Butler Var Boys win 2554-2250 over Fairborn. Aaron Seelbaugh 457 (243-214), Ben French 454 (224-230), Will Yeary 450 (172-278), Drew Sacks 450 (268-182), Jake Smith 189. Butler Varsity Girls fall to Fairborn 2194-1825. Emily Gabert led the scoring for Butler with a 388 (198-190) set, followed by Breanne Kroeker’s 383 (126-257) set and Alissa Spieles 360 (225-135) set.